Chances are if you’re looking for an internship you’re probably already feeling overwhelmed. Just a simple Google search gives you about 12,600,000 results and to make matters worse, they all vie for your attention. It’s like an episode of The Bachelorette but instead of attractive Ryan Gosling-esque guys trying to pursue you, it’s a bunch of websites claiming to be the “best” and “only” one you need to find the perfect internship. This guide makes narrowing them down easier with career counselor at University of Washington, Patrick Chidsey’s top picks to make the process less painful. You might not find your Ryan Gosling but you’re bound to find a great internship, which is almost the same thing. Find out what it takes to land internships for college students from actual interns on our Internship Directory. It’s basically the eHarmony of internship sites, allowing you to search for internships based on major, job category, city and company. Plus, it features other resources like tips and stories from other interns. To get the most out of this site be sure to make an account. You can use their popular “Internship Predictor” to match you up with internships based on your personality and references. 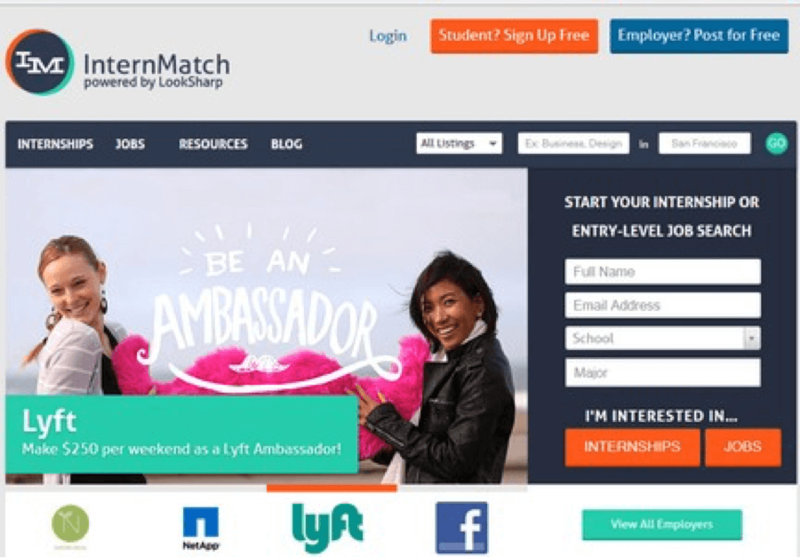 InternMatch features a blog and forum where you can ask for help on your application or just complain about your internship with complete strangers around the country, which is always fun. Along with an easy search option that narrows down internships based on your location and interests, this website lets you search for entry-level jobs, which come in handy for when you graduate. Consider making an account for this one because they update the site often and you don’t want to miss out on any opportunities to make the world a better place, right? Of course not. If you know that you want to intern for a nonprofit organization, this is the perfect website for you. Their tagline is “we connect idealists with opportunities for action” which is exactly what it does–finally some truth in advertising. You can easily search for internships based on area of focus or spoken language, whether they’re paid or unpaid. 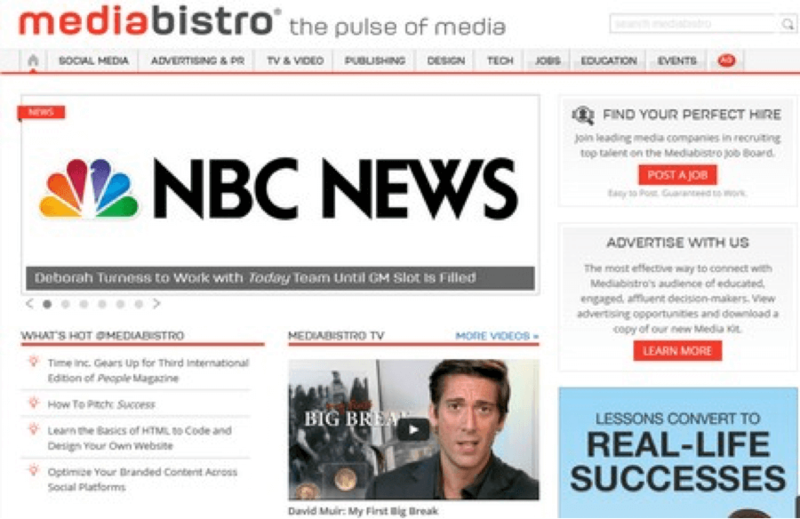 For anyone looking for a career in the media, MediaBistro is the place to look. Focused entirely on careers in the media industry, this site lets you find internships and jobs in advertising, social media, TV and video, publishing, design and technology among many more. A piece of advice: filter your searches to your interests because looking through all of the posted internships sounds almost as painful as watching an entire episode of Keeping Up With The Kardashians. So easy that even on those days you wake up with a killer hangover, you’ll still be able to continue your internship search. With only two blanks to fill in, what and where, it takes less than a minute to find internships. That’s it. Indeed.com also gives you the option to upload your resume for employers to read; they can contact you if you fit a position they seek. This website is exclusively personalized to fit you. By entering your interests, location and school you’ll find internships in your area and benefits tied to your school like career fairs and connections with local employers. Highly regarded, this website is used in the career centers of major universities such as Duke University and University of Tampa. You have to sign up for an account in order to apply for the internships so break out a carefully crafted username and the same password you’ve been using since sixth grade. 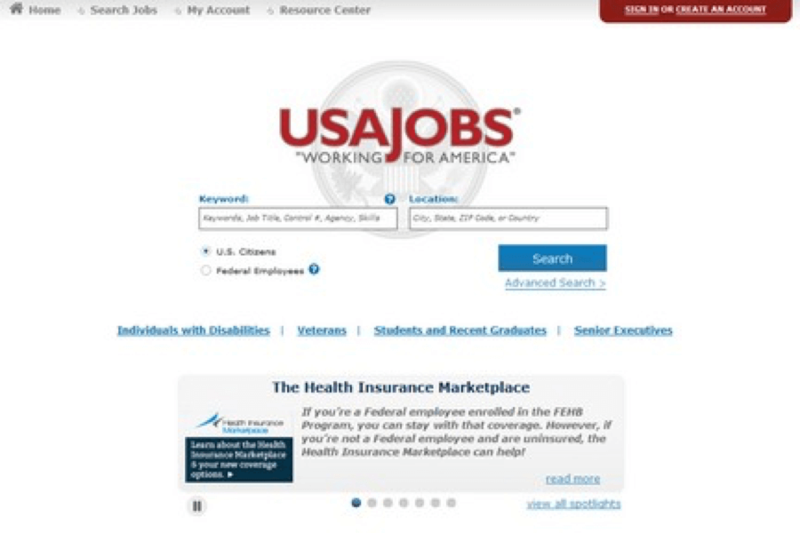 As the name suggests, this site is centered on internships and jobs in the government system. Through this site you can find internships with the Department of the Air Force, the United States Attorney Office and the Navy, among many more. These internships are competitive but think of how cool it’ll be to tell people you spent the summer interning for the Department of Defense. Sure, you could intern in your hometown but wouldn’t you rather be in Spain or France? Yes, yes and yes. That’s the exact reason this site was created. 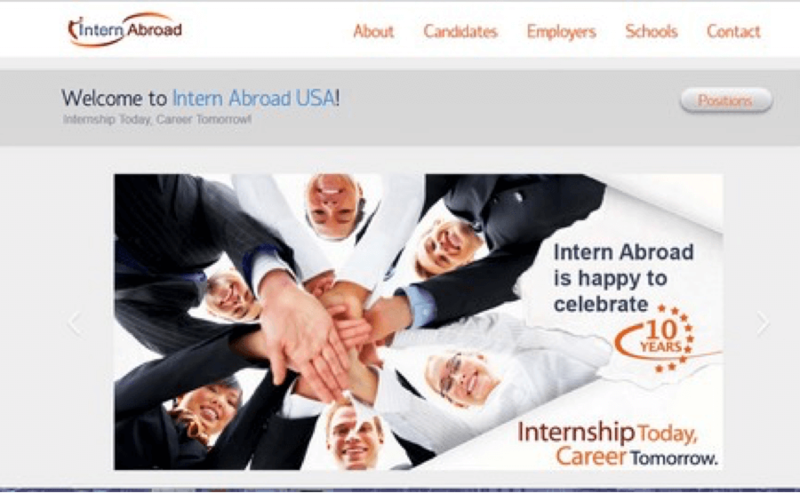 It’s designed to connect those seeking an experience abroad with international organizations. 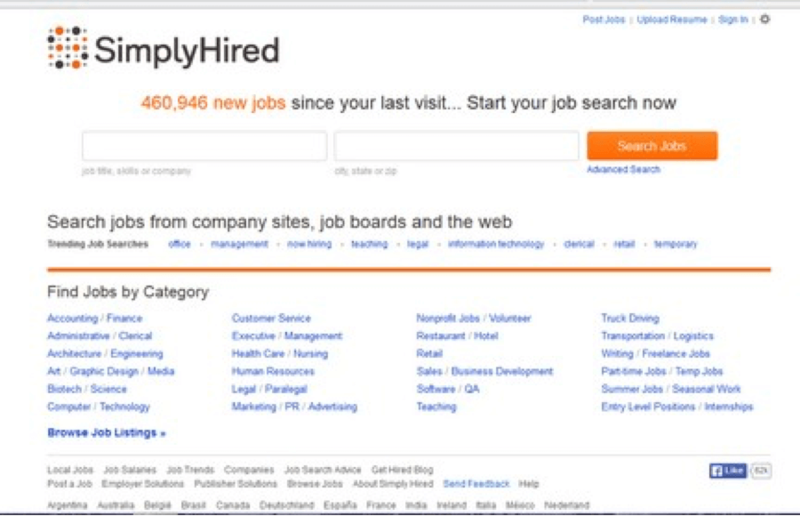 Just enter your desired internship and location and you’ll come up with a list of opportunities on SimplyHired. The cool thing about this website is that its job listings come from all around the web, including direct employer websites, job boards, etc. It also has unique filters like “dog-friendly company” for all you dog lovers. You can buy various books with tips for finding internships from this website because we all know how much fun it is to read a book about internships. 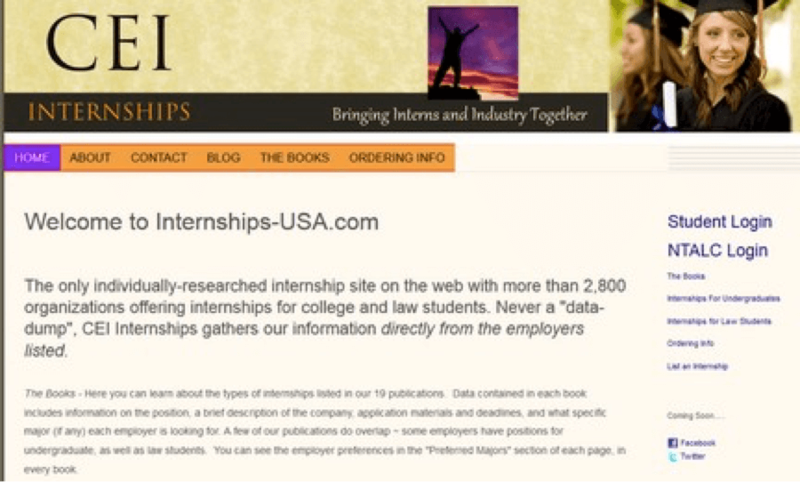 If the whole book thing doesn’t appeal to you, check out the site’s up-to-date information on finding an internship in over 2,800 organizations. With so many different organizations, you’re bound to find something for you. 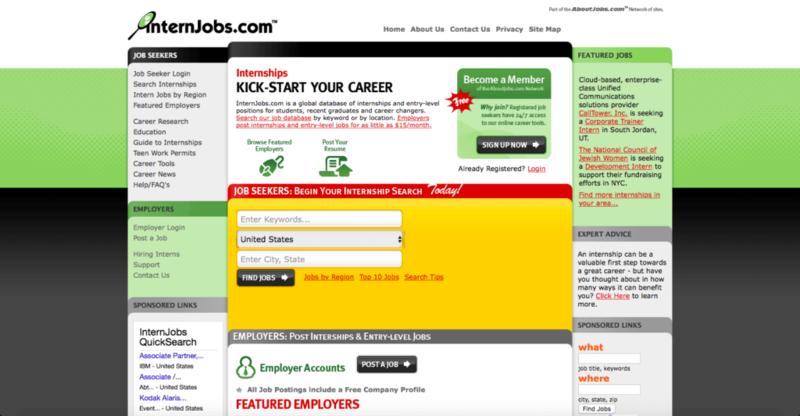 It also lets you search for paid or unpaid internships, seasonal internships and nonprofit ones as well. Need another internship finder to land your dream position? Look no further. Pair your social media obsession with finding an internship. Not only does LinkedIn connect you with recruiters and jobs, but friends, too. It’ll keep you up-to-date on every job, skill and achievement from your friends, previous employers and large, famous business people. Beyond that, you can see every person that has viewed your profile. Good thing Facebook hasn’t come up with that…yet. LinkedIn is great because it filters what jobs it thinks you’re a good fit for. “I could spend hours looking at jobs and internships on LinkedIn. Scrolling through it makes me aware of so many opportunities, and I have even applied to jobs by just looking through,” said Elon University junior Sophie Zuriff. You can talk directly to employers and they can see your resume right away. One of the best features? Companies that have easy applications. All you have to do is press “Easy Apply” and LinkedIn will send the company your resume and phone number. Sometimes they ask for a cover letter. If the company thinks you’re a good fit, they can directly contact you. Take all of the upward and downward comparisons you learned from Psych 101 class and put it to use on Glassdoor. This job/internship finder helps you compare salaries, reviews, benefits, interview questions and employee satisfaction to other companies. It allows you to see which companies are hiring and what it is really like to work there from past reviews, not just what the company says about themselves. If you’re a little nervous about heading to an interview, you can see what former applicants have said their interviews were like. If you’re lucky enough, someone may have even included the interview questions they were asked. ”Glassdoor has a hub just for students called Glassdoor for Students, which is the best job search resource for starting your new career. Here you can find internships and entry level jobs, research salaries, companies, career paths and prep for interviews,” said Glassdoor community expert Alison Sullivan. This site will also help you find the right job/internship for you based off of your previous searches, interests and level of education. What could be better than hearing the ins and outs from people who have actually been on the inside? Formerly known as Campus Jobs, WayUp is the perfect internship finder. It is designed specifically for early career professionals. 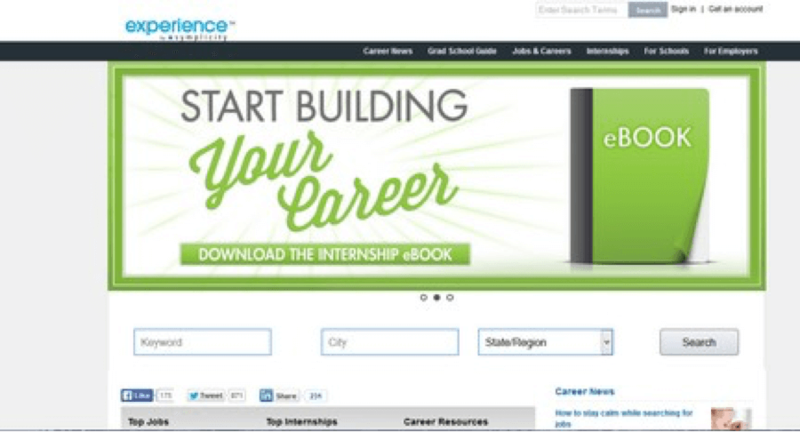 You can explore internships and jobs, get advice and become discovered by employers. When you sign up, you have to answer some personal information including past experiences. When that’s completed, you’re granted access to see enough opportunities to keep you busy for hours. All opportunities are specifically chosen for you. Employers have to show what qualifications they need, so only jobs/internships that you’re qualified for will be shown to you. Say goodbye to seeing your dream job and not being able to do anything about it. What’s a major bonus to getting experience? Making money, of course. That’s where InternJobs comes in. As a global database, this internship website finds internships and entry level jobs for college students and recent graduates. The jobs posted give you the chance to make as little as $15 per hour. So, go ahead and search the database with any keyword of what you are interested and get ready to make some money, build your resume and learn all at the same time. #winning. Looking for jobs and internships can feel as scary as the monster you thought lived under your bed when you were little. But, MonsterCollege makes it better. 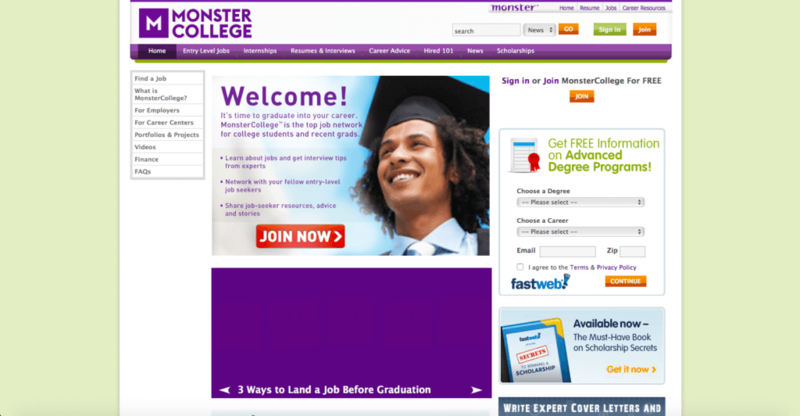 Designed for college students and recent grads, MonsterCollege lets you learn about specific jobs, get interview advice, talk to other people searching for jobs and even find a job. So, no need to be scared of the future… what was under your bed in the past. CareerShift is a website all about making connections. It can be used by individuals, organizations and institutions. According to their site, “Users can find current job connections and make meaningful new connections.” So, whether you’re looking for a job now, some new business friends or just want to have connections for later on in your career, CareerShit is the website to go to if you’re ready to jumpstart turning your major into a career. Pairing your wanderlust with interning, teaching or volunteering. GoAbroad makes teaching a different language and learning a different culture possible. Either by searching what type of internship you want, such as teaching a language in a foreign country or volunteering with elephants in Thailand, or what country you want to travel to, GoAbroad will pair you with options that fit your needs. “GoAbroad.com is the most comprehensive online resource for meaningful travel experiences. You can find everything you need for your trip (or life) abroad on GoAbroad, whether you’re looking for programs, extensive country guides, scholarship opportunities, insurance, travel tips or expert advice. Meaningful travel starts here,” said GoAbroad employee Elsa Alingasa. With dozens of different countries and hundreds of different internship opportunities, GoAbroad is a great resource for visiting the Colosseum in Rome and exploring the beaches of Australia while building your resume at the same time. Finding an internship definitely proves to be hard. But when a site like Intern Queen makes you feel and sound like royalty, it may be a little bit better. Intern Queen was created to make a more personalized process for college students and recent grads to connect with internship and career opportunities. No more settling just to find summer plans. Actually get the internship of your dreams. By searching for a general topic, marketing or psychology, for an internship, students can look through the website and see dozens of potential opportunities. Businesses can also post job listings, so it’s a two-way street. CoolWorks is a job finder for the adventurous soul. The main objective is job seeking for the fearless and travel lovers. “CoolWorks is sort of a magical rabbit hole or hidden passageway. It’s the chance to go somewhere new, meet someone new, be someone new—or even better, continue to figure out who it is we want to be in an incredible environment,” said CoolWorks employee Kelcy Fowler. Absolute Internships attracts the adventurous college student and post-grad. The website works with companies to provide students with the opportunity to learn and explore their passions in a work setting abroad. Students apply through Absolute, which is the internship program. You’ll find dozens of different industries they can be in, such as accounting, event planning, fashion, logistics, marketing or non-profit. This website is a bit different from others because all internships go through the Absolute program. Prospective students have to apply and interview with Absolute first. Once accepted, they’ll help you figure out where you’ll be placed. Internship locations even include cool cities like Hong Kong or London. Updated on July 13, 2017 by Samantha Slavin to include internship websites 11-20. Elizabeth is a junior at University of Washington majoring in Journalism and Comparative Literature. She's always trying to be less sarcastic and always fails miserably. One time she met George Clooney and everything in the world made sense for those precious three seconds.